With the scattered hillside settlements and fields stretching to the moors covered in snow, the patterns in the landscape couldn't have been more evident. Librarian/archivist of Hebden Bridge History Society Nigel Smith has studied these patterns and the way settlement and enclosure developed in the valley for some years and was recently awarded a PhD for his work. He told the society how his investigation into the way people had settled and enclosed the land drew on documentary and place-name evidence, but was also strongly rooted in the geography of the area. Of particular importance were the gently sloping terraces of land lying between the 200 - 300 metre contours which had better soil and plentiful springs of water. Place names pointed to a reason for some of the settlements on these hillsides - the local place name ending 'tonstall' probably indicates a site which provided summer pasture for cattle. Place-names with 'hey' and 'shey' (which later became 'shaw') indicated rough grazing or woodland pasture, and often seem to have been shared with different farmers having rights to graze a set number of cows there. 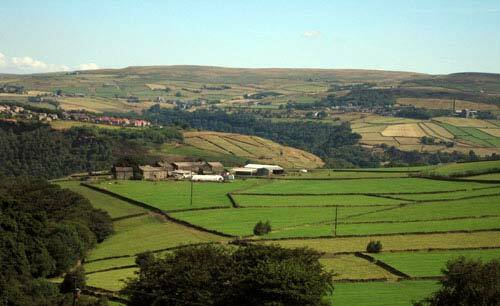 Another characteristic of our local landscape is the large number of dispersed farmsteads and small hamlets. These are typical of a pastoral type of farming. When land was divided between members of the family, we often see two farms close together with shared names such as Upper and Lower or Near and Far. Land-holdings grew as farmers gained permission from the lord of the manor to make new clearances or encroachments which would provide profitable rents. Nigel cautioned that the shapes of fields is not a good pointer to the age of a settlement - historians have sometimes seen an inverted 's' shape as evidence of a medieval common field system, but some such strips were also created in the nineteenth century. Oval fields were often made from early clearances as the most economical type, but these were still common in nineteenth century enclosures. Nigel's talk made very effective use of maps which showed vividly how the settlement of our valley developed and pulled together the topographical, place-name and documentary evidence. As well as publishing his findings in an academic book, Nigel has made much of his documentary evidence available on-line. The fully searchable South Pennine History Group website www.southpenninehistorygroup.org.uk provides a fabulously rich resource for anyone interested in the history of this area.